BANGKOK: The government has advised mourners at Sanam Luang to conduct themselves strictly in keeping with the propriety and solemnity of the event. Prime Minister’s Office Minister Suwaphan Tanyuvardhana said yesterday (Oct 26) that people should observe etiquette and behave accordingly. He also warned against bogus volunteers who exploit mourners. Some people also turned up at Sanam Luang only for the photo opportunities and to get free meals, according to Mr Suwaphan. The minister said he believed most people wanted to sincerely show their love and mourn the late King. 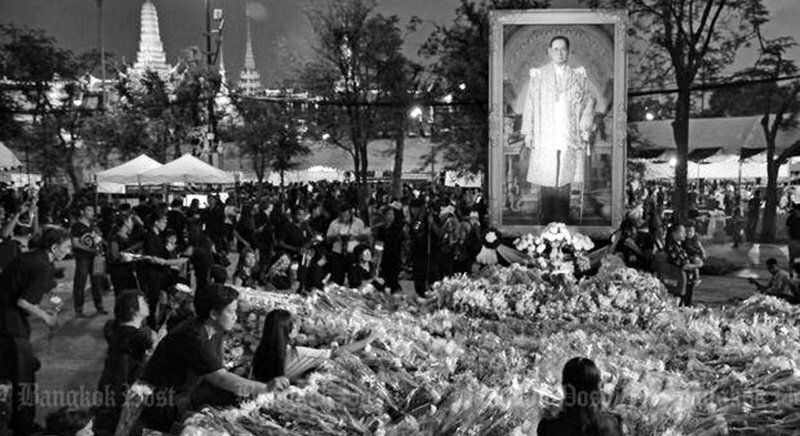 This is a time when many Thais are in deep sorrow and want to express their loyalty to the highly revered King. People should stop behaving in a way that diminishes the event, Mr Suwaphan said, adding it is hard for the authorities to ban improper behaviour. Mr Suwaphan said officials who inspect the area will issue warnings to people who misbehave. The authorities also claimed some street vendors had queued up to get a serving of free food and then move away to resell it, said deputy Army Region 1 chief Phongsawat Phannachit, who was assigned to maintain order and regulate traffic in the areas surrounding the Grand Palace. Thesakit (city inspectors) have been told to keep an eye out for the sale of donated food, he said. The government has set up a joint command at Sanam Luang to handle the large crowds of mourners and maintain law and order in the area. National police chief Chakthip Chaijinda said police have received reports of mourners at Sanam Luang being deceived by motorcycle taxis who lied about providing free rides. To deal with the problem, the command will require volunteer motorcyclists to register with police so their backgrounds can be checked, Maj Gen Phongsawat said, adding people can report bogus volunteers to the 1197 police hotline. Volunteers helping out at Sanam Luang, including those who collect rubbish, are also advised to register with the police for the sake of visitors. Authorities are also boosting security around the Grand Palace by installing more closed-circuit cameras in and around Sanam Luang, Maj Gen Phongsawat said. Though police are currently not worried about security in the area, they have increased the number of patrol officers and set up more checkpoints. There are now nine such checkpoints, said Surachet Hakphan, acting chief of the Patrol and Special Operation Division. On Tuesday (Oct 25), police manning the checkpoints found more than 200 sharp and dangerous items including cutters, scissors and even knuckledusters as they scanned the belongings of people entering Sanam Luang. They confiscated the items. “It’s not necessary to carry them [for protection] because we already have a number of police and soldiers in place,” city police chief Sanit Mahathavorn said.